My four-year-old daughter Ella is lying face-down on her bed, helpless with grief. Her tear-streaked face is buried in the duvet and she is kicking her legs furiously. In between muffled sobs I make out the words: ‘But I looove her, I waaant her,’ repeated over and over again. What has caused such a scene? Well, a nasty person took her Barbie away from her and refuses to give it back. And, unfortunately, that horrible bully is me. I admit I feel a pang of guilt, especially as over the past 24 hours I’ve taken away all of her other toys, too. There’s the play kitchen with its saucepan set, mini tea towel and pretend food, her farm set with animals, the tiny cot and her baby dolls, the supermarket play set with tills that ‘ding’, ‘beep’ and ‘ker-ching’ (almost) realistically, the vet’s centre, doctor’s kit and mini tool box. All gone. And she’s not the only one affected. With bad timing, my son Alex had his second birthday last week and received piles of presents. He’s barely had a chance to try them out, but already he’s barred from playing with a bus that plays a tune when you press the steering wheel; a pull-along tractor and trailer with a revolving pig; six cars; a garage set and fire engine that has flashing lights and makes three different siren sounds. I have also outlawed TV and DVDs. So no Peppa Pig for Alex at 6.30am, which he watches on my husband’s iPhone while we grab a few extra precious minutes of dozing time. 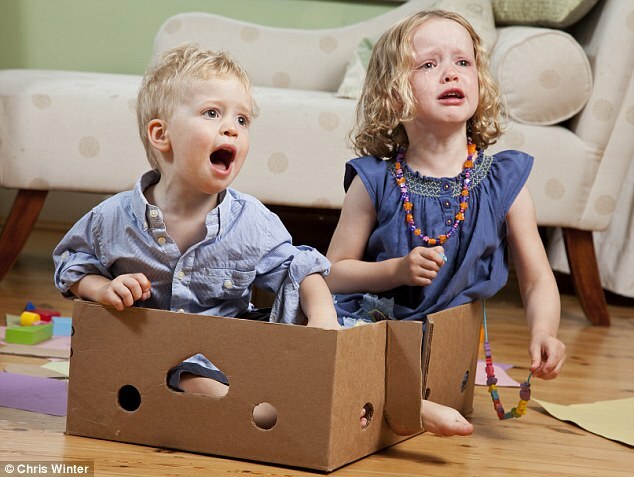 Outlawed: Clare banned her children from watching television or DVDs. And, most shockingly of all, no Disney movie after lunch for Ella while Alex sleeps and I catch up with work, emails and sometimes, I admit, Facebook. I’m not totally cruel. My children still have some things to play with. Who wouldn’t be satisfied with building bricks, embroidery silks, beads, coloured pencils, coloured paper, pieces of cardboard, modelling clay and two toy figures? 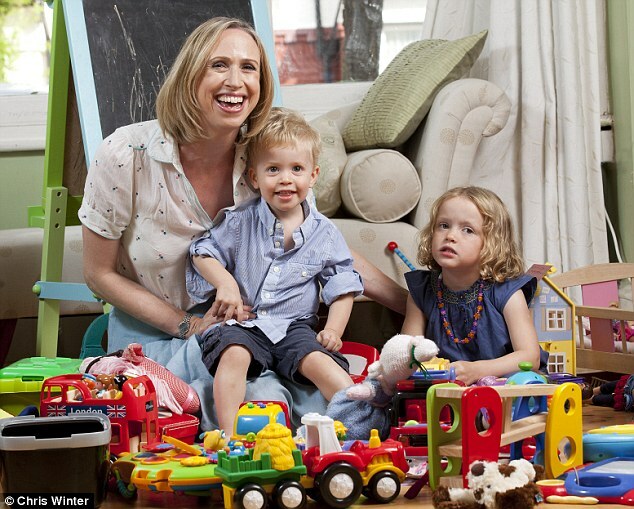 The research, commissioned by the makers of Ribena Plus, into the effect of the modern world on children’s play revealed that parents feel pressured to spend thousands of pounds on hi-tech gadgets and toys to entertain their children, with the average family spending £10,021 on toys before a child turns 18. Apparently, screen-based activities ‘dominate’ youngsters’ lives — something to which I can certainly relate. Yet, according to experts, children would be better off given just eight everyday items worth £6.12. They claim these will stimulate their imaginations and be better for their development. But can they really keep a child happy? Not to mention quiet. While I’m sceptical about this, I’m also concerned about the amount of time my children spend watching TV and playing with branded toys, be they Peppa Pig or Thomas The Tank Engine. So I decide to embrace the challenge and see what happens. 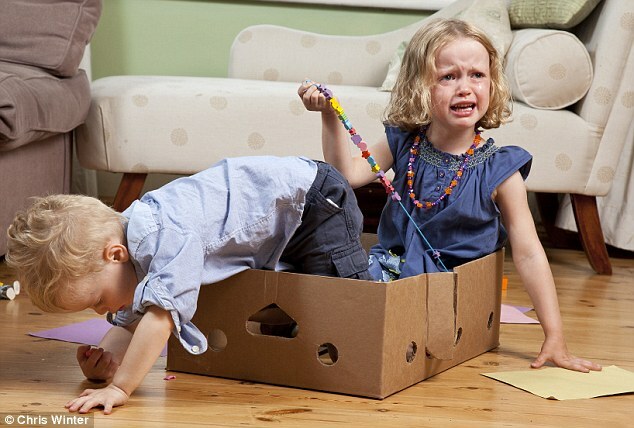 It’s fair to say Ella and Alex’s initial reaction to their new, slimmed-down toybox is far from enthusiastic. While Alex is, as yet, a man of few words — he just looks at me and says ‘Car’ hopefully — Ella doesn’t hold back. ‘I don’t want to play with Play-Doh, I want to watch CBeebies,’ is her response, when I suggest she might want to do some modelling. ‘Bricks are stupid. I don’t want to make a tower,’ is her retort to my next suggestion. Her reaction to discovering Barbie is off-limits makes me feel so guilty, or desperate, that I ring those behind the report to check if she can’t be included as a ‘toy figure’. Sadly for Ella, Barbie is deemed just too commercial. Eventually, however, Ella’s tears dry and she consents to play with modelling clay on the proviso that I join in, tSo I am forced to spend an hour ‘cooking’ with some green and blue Play-Doh, with Ella making some rather unappetising ‘raspberry tart birthday cakes’ and Alex rolling his clay into pretend vegetables ‘Callot (carrot) there,’ he says proudly. 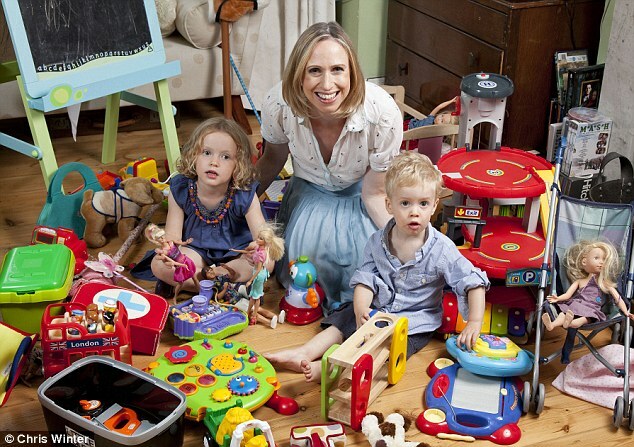 It quickly becomes clear that these basic toys are entertaining enough — as long as Mummy is happy to play, too. The children are absolutely fine with them as long as they are not left to play alone. In fact, it takes them less than a day to work out that their new toys are actually pretty brilliant, as they are a sure-fire means of getting attention from me. But that does mean constant attention, which I’m just not used to. Over the years, I have lost count of the number of times I’ve said I’ll come and play with Ella and Alex ‘in a minute’, and yet I never do. When there are chores to be done — or I simply fancy a break — it’s easier to switch on the TV or push them in the direction of a toy that doesn’t require me to do anything. Coloured embroidery threads, Coloured paper, Drawing pencils, Wooden shapes or building blocks, Modelling clay, Beads, Toy figures Cardboard pieces. And, frankly, it’s also pretty boring for an adult to sit for hours making pretend ham and cheese sandwiches, or drawing identical pictures of kites and rainbows . . . over and over again. Sally Goddard Blythe, a consultant in neuro-developmental education who advised on the report, says that my children’s response is typical. In fact, increasing the interaction between parent and child is a key aim of the pocket playground. That’s all very well, but by the end of the second day I am ready to throw my toys out of my pram. Not only have I been forced to interact with my children at 6.30am, reading them stories instead of reaching for the iPhone, I have threaded bead upon bead, stuck Plasticine to the sides of a cardboard box for an hour (because Ella believes this will transform it into a robot), and attempted to make a friendship bracelet from the embroidery threads. The jewellery is about as successful as the mini pompom we have a go at, which is decidedly floppy. I have also peeled countless gobs of Plasticine and Play-Doh off the bottom of my shoe, and swept up hundreds of beads. Hardest of all, though, is the lack of post-lunch peace. I feel I might go mad if I don’t get a few minutes to myself at some point during the day. But halfway through the week, I start noticing changes. No, Mum! Alex and Clare’s initial reaction to their new, slimmed-down toybox is far from enthusiasticThere’s no asking for CBeebies as soon they wake up (although I confess we do lapse early one morning when we’re feeling particularly exhausted and allow Alex to watch a Peppa Pig episode in our bed) and, in fact, far fewer requests for TV or films than I expected.The weather is good and they start playing in the garden straight after breakfast. I am surprised to discover just how much I enjoy watching my children’s imaginations in action, and love the escapades Ella has with the little wooden figures that she names Maggie and Ben. They remind me of the peg dolls my mum made for me when I was little. Amazingly, when I do have to leave them to it while I put on a load of washing, they manage quite well by themselves. The interaction between the children improves, too. There’s no bickering because Alex has snatched Barbie or accidentally kicked over one of Ella’s elaborate plastic picnics. They start to improvise and play with other household objects, too. A piece of pink chiffon and a pencil becomes a kite. One morning, they entertain themselves happily for half an hour walking around in pairs of my high heels. Even Alex. Another morning, I emerge from the shower to the sound of silence. Panicked, I dash downstairs — to find them sitting on the sofa with a book. This is a first. When I do have to spend some time on work emails, I have no qualms telling Ella that I can’t play with her — and she accepts it without her customary whining. But the biggest test comes on a tortuous three-hour car journey from our home in London to visit relatives in Salisbury. Can we survive without emergency episodes of Peppa Pig on the iPad? I put the box containing the pocket playground between their car seats, and that, plus a few rounds of I-Spy, genuinely seems to keep them happy. When, after seven days, the experiment is over, the children are undoubtedly pleased to be reunited with their old toys. Alex joyously whizzes his fire engine around the house, and Ella puts Barbie through four changes of outfit before taking her and Ken on an elaborate adventure. But the new toys haven’t been rejected, and the children do seem generally less bothered about watching TV. They have also carried on playing with everyday bits and pieces around the house. So will we return to our old ways? Well, yes and no. I’ll always keep an emergency pocket playground in the car, and there will be no TV allowed after breakfast. And while I’m not going to be giving away the toys we already have — it’s not realistic to expect the children to carry on playing with just eight things and, as a working mother, it’s also just not feasible to spend all my time at their beck and call — I will make more of an effort to play with them, whether it involves Peppa Pig or some pencils and paper. And who knows, I may even learn to love finding modelling clay on the bottom of my shoe. 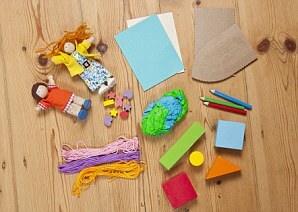 This entry was posted in Creativity, Play and tagged Cardboard box, consumerism, creative play, Play, self directed. Bookmark the permalink.